These tracks are optional and are useful when choosing coursework for the Economics major requirements. If you chose to follow one of these specializations, you will still need to satisfy the remaining major required coursework. *Only one specialization track may be chosen. * If you read about our specializations via the General Catalog, we highly recommend that you contact one of our major advisors if you have questions or concerns. If you are considering following any one of these tracks, you will need to notify one of the advisors in the Economics, History and East Asian Studies Advising Center located in 2216 Social Sciences and Humanities. Students in this specialization examine decision-making especially as it relates to businesses and the impact of market structures. Possible career paths would include market research analyst for a company as well as associate at a consulting firm. Students in this specialization examine theories and models used to analyze data, identify empirical patterns, forecast economic variables, and make decisions. Possible career paths would include data scientist for a company or a data analyst position in the healthcare or related industry. Students in this specialization examine the economies of the past and how historical trends and events have shaped our current and possible future economic landscape. Possible career paths would include law school or secondary education social studies teacher. Students in this specialization examine our interdependent world using the tools of macroeconomics and finance. Possible career paths would include analyst at a financial company or international economist for a governmental agency or non-profit. Students in this specialization examine the design, implementation, and impact of governmental economic policies. Possible career paths would include policy analyst for a government agency or research analyst for a private think tank. Students in this specialization examine issues of economic growth, development, and inequality from an individual as well as national level. Possible career paths would include analyst for a non-profit advocacy group or development economist for an international agency. NOTE: The specialization will be listed on your transcript, not on your degree. To receive this notation, you will need to let an Economic advisor know which specialization you are following by the start of your graduating quarter. Schedule your appointment with a staff advisor today! Be sure to select "Economics"
Get some new threads — Economically! 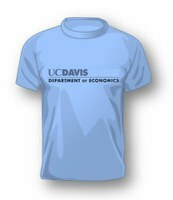 Order your cool UC Davis Economics T-shirt — only $20.